Last week, little man celebrated his seventh birthday. Since we were surprising him with a pretty nice gift, we decided that we would celebrate with family and just a few close friends to keep things festive, but easy. We ordered a bounce house and even though he didn’t know that he was having any guests, little man did request having a few Minecraft details for his big day. 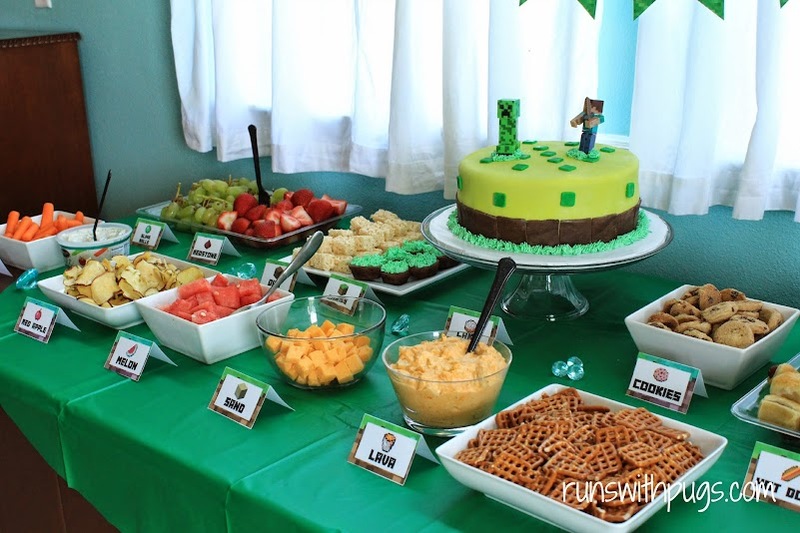 Minecraft is ridiculously popular with the kids, but for some reason, it’s pretty hard to find premade party supplies. I had to rely on Etsy, some free printables and Pinterest for ideas. However, it was pretty simple to pull together and it ended up looking great. Our guests arrived around 2:00, so we offered a variety of heavy appetizer type foods. We served carrots, slime balls (green grapes), red stone (strawberries), gold (cheddar cheese cubes), lava (buffalo chicken dip), watermelon, red apples, trapdoors (square pretzels), sand (rice krispie treats), dirt (brownies with grass frosting), cookies, hot dogs and chicken nuggets. 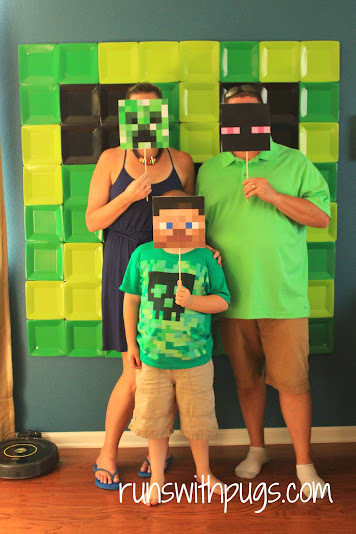 for photos in front of a paper plate Creeper. 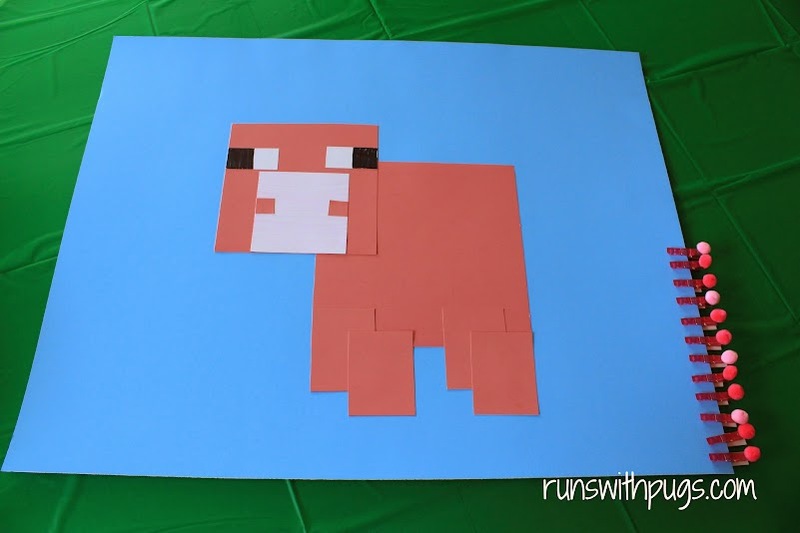 We had a few games – I made a Creeper out of green poster board and packing boxes, with the eyes and mouth cut out for a bean bag toss and this Pin the Tail on the Pig game. I think my favorite detail of the party were the tissue paper grass mats on top of the table. It was too windy to put out places settings as I originally planned, but the grass was pretty cool anyway. 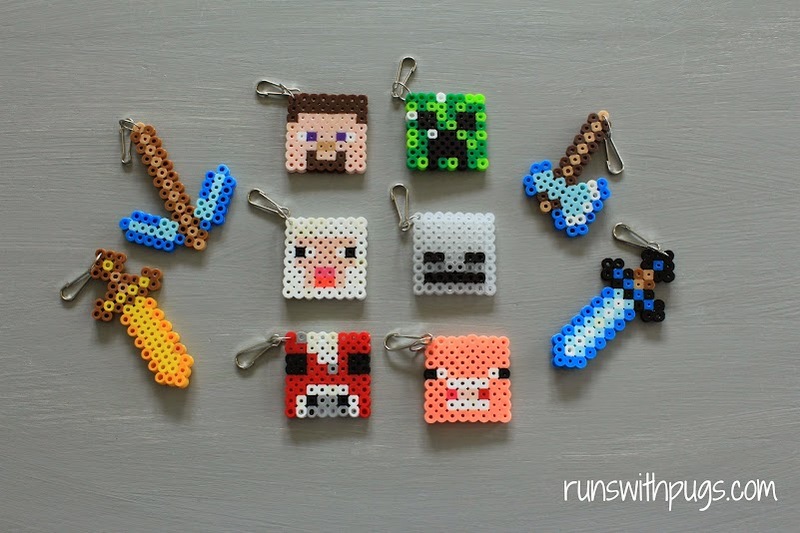 In a sudden burst of creativity, I also made these little perler bead keychains. 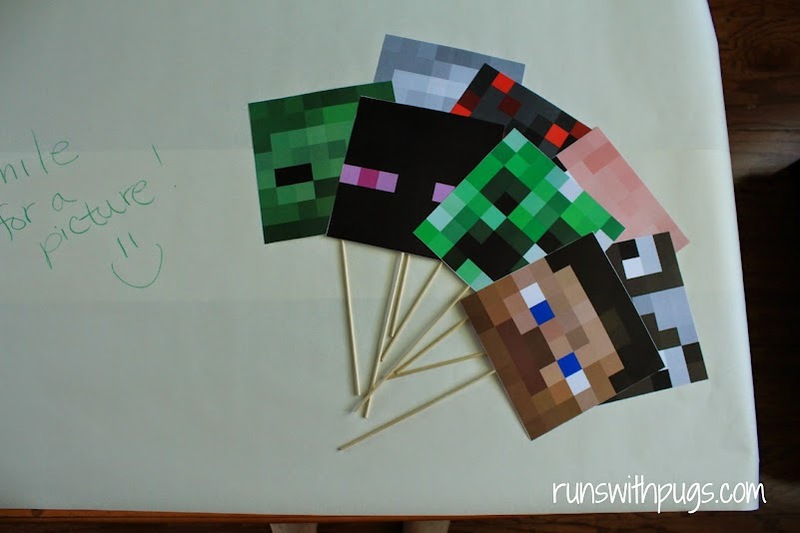 It was actually a pretty fun craft for myself, and little man wants to make some on his own. Happy 7th Birthday, little man! And here’s something else to celebrate! 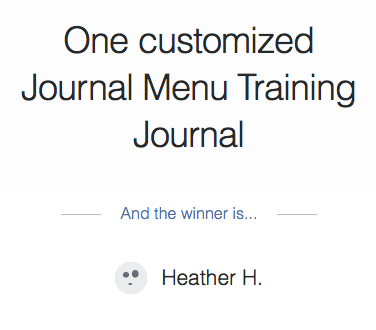 We have a winner for our Journal Menu Training Journal! 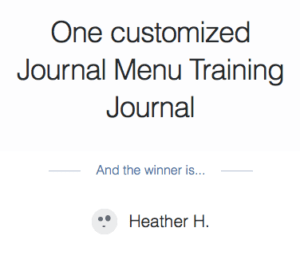 Heather, email me at runswithpugs @ gmail . com so we can get you started! What is something that makes a party great for you? Do you like planning and executing events? Well, I’m local, if she ever needs any help! I love doing this kind of thing! Congratulations to your sibs! I do *not* enjoy planning parties. At all. 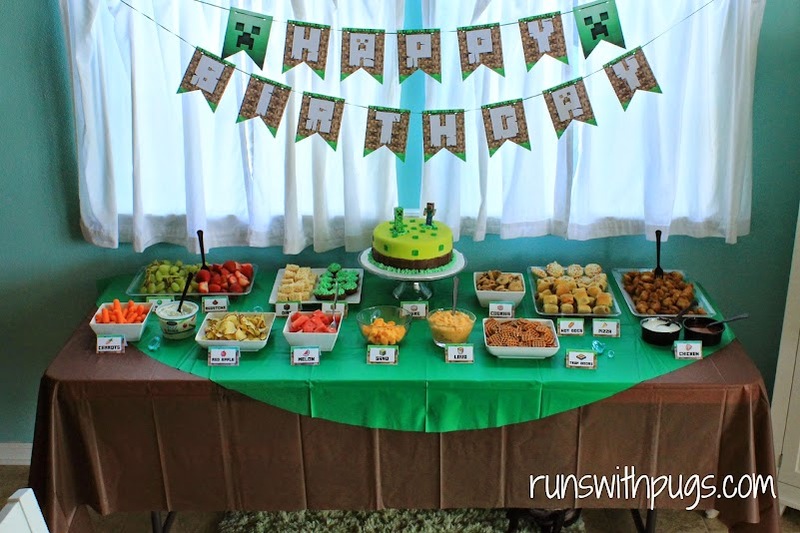 But my recently-turned-9-year-old would have LOVED this Minecraft party!!!! Super job!! Thank you! It was a lot of fun to put together! This is adorable! I don’t know anything about Minecraft, other than that the characters are all pixel-y, but you did a great job! I love the photo booth and masks! Nice work with the healthy snacks too! Everything looks delicious! I LOVE planning parties! I mean, who has the time really? But it’s so fun! I threw my best friend’s baby shower, and had such a blast putting it all together. It can be tough to stay on budget though. Also.. I have terrible luck in general. As the weekend of her party approached we had a very small thunder storm, that for some reason knocked out power. For three days. I didn’t think I would have it back for the party, but thankfully it came on the morning of. Unfortunately, the baker I hired to make the cake also had no power and thus couldn’t bake me the fancy cake I ordered. She made me a dummy cake that looked amazing, but I had to buy a sheet cake at the grocery store last minute to actually feed people. Ah… the best laid plans! I am the worst at staying on or under budget. I did pretty well with this one, though. The bounce house was the big splurge and the kids loved that, as well as playing with the rest of the toys in the house. Ack! That’s crazy about the baker! I would freak out if that happened to me – on either end! I have no idea what this game is! LOL! but you put together a cute party- great job! 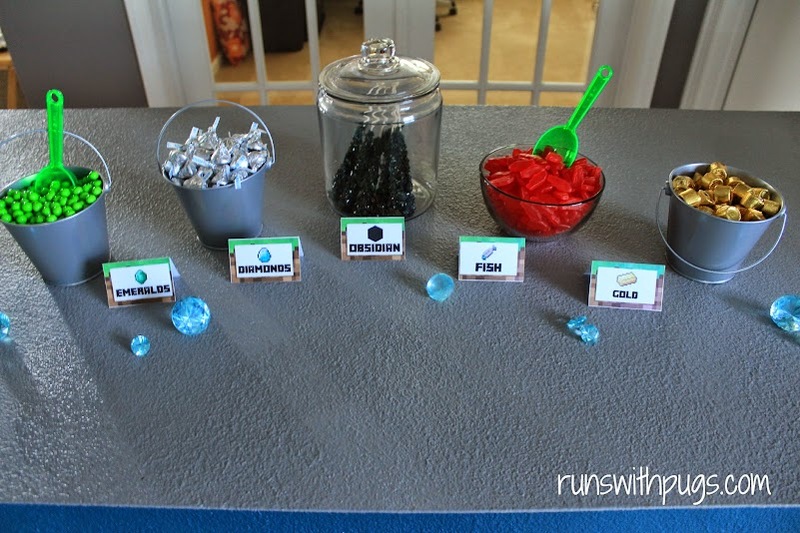 Mary Beth Jackson recently posted…My Favorite treats……..
No one knows what this game is! I think that’s the whole point! So cute! Although I have no idea what minecraft is. No one knows! I’m convinced of it! You are so crafty! I am in the process of planning my daughter’s 5th birthday party, and I am not enjoying it. I am not the creative type. What’s the theme? It’s hard when you don’t enjoy it, but I know she will love whatever you put together for her, as long as it’s from the heart! Dang, I wish he’d picked My Little Pony because my daughter has chosen that theme and your ideas for parties are SO GOOD! 🙂 Minecraft was a fun idea and I love all of the creative touches! jan recently posted…Do You Believe in Signs? Oh, I would love to do a MLP party! How fun! I loved MLP as a kid and although it’s changed quite a bit visually, I bet it would be a blast to put that together. Remember. Pinterest is your friend!